WASHINGTON (CNS) — With the gifts given them through baptism, confirmation and the Eucharist, Catholics have the tools needed to repair a world broken “in thousands of pieces,” said the archbishop who chairs the U.S. bishops’ Committee on International Justice and Peace. “At the end of every Mass we are sent forth not merely to clear out the church, but go and share what we have experienced,” said Archbishop Timothy P. Broglio of the U.S. Archdiocese for the Military Services at a Feb. 4 morning Mass during the Catholic Social Ministry Gathering in Washington. One thing people have to be prepared to ditch, Archbishop Broglio said, is their tacit acceptance of the status quo. 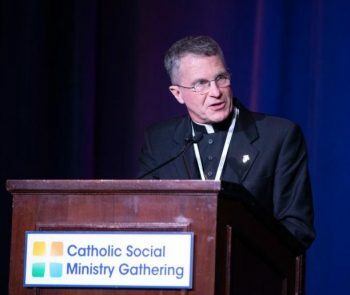 Archbishop Broglio said, “If the current crisis of trust teaches us anything, it is that all of us — bishops, religious, priests and laity — must be coherent. “One of the challenges of our Catholic faith is its universality: We can never be reduced to one doctrine or dismissed as right, left or center,” he added. Archbishop Broglio prefaced his homily with the tale of the English violinist who was lent a Stradivarius to perform at a concert in Iceland. The violinist stumbled and fell on the concert stage. He survived the fall; the violin, not so much. But a patient restorer painstakingly restored the Stradivarius.